I’m down to counting days, now. My niece Laura (and friend) just left for Cappadocia after staying with me for a delightful seventeen days, my AFS daughter Mayu (and friend) will be here for nine days (including four in Cappadocia), and in fourteen days I’ll be boarding a plane for Germany on my way home. Oh, my goodness! Time is flying, and thankfully it’s not particularly HOT time. Busy time, though. 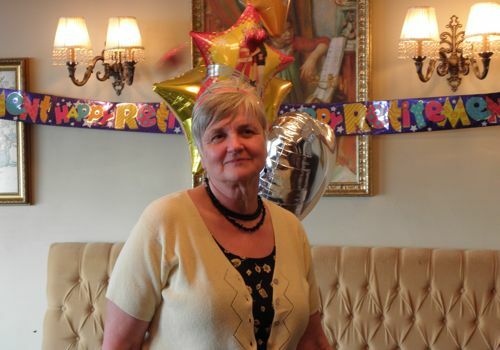 Last weekend I was asked to take photos for a friend’s retirement party; Diane has taught English at Robert College for “forever” (as she puts it), and she was enthusiastically celebrated by her peers at a restaurant reception. 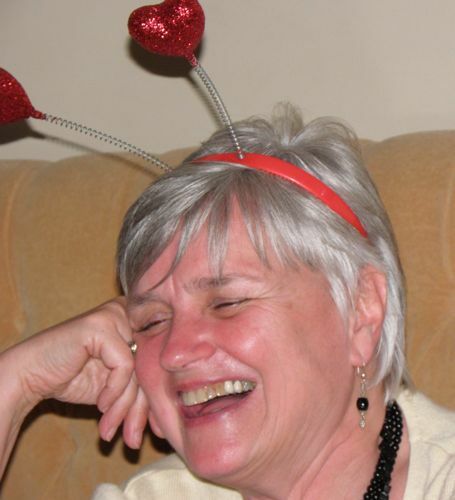 She spent a lot of the evening laughing (in spite of the fact that she was the LAST person to be served), and—bless her heart—she wore a goofy heart-antennae headband all night long. It was definitely a gleeful night. I hope she enjoys retirement; actually, I don’t know anyone who doesn’t. Next year Diane and I will both be free to sleep in, relax with a novel, and just lollygag our way through each day. It will be interesting to see how expertly we meet that lofty goal. Saturday morning I rousted Laura and Yvette early to do a tour of Sultanahmet. Jeff Wilhelm was at Robert giving seminars for English teachers, and he joined us for the day as well. 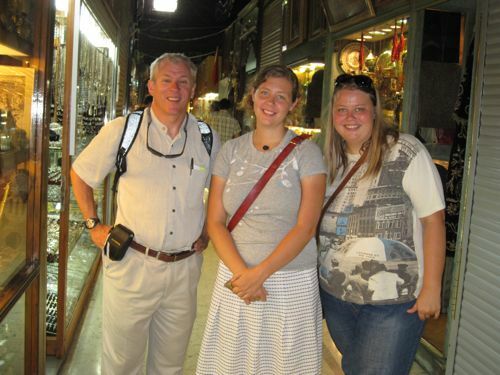 I shared all of my favorite haunts around the Grand Bazaar, including some of Edda’s hidden treasures from our guidebook. 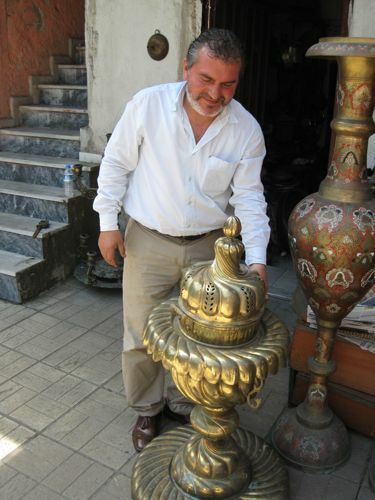 Nizan Bey demonstrates an antique room heater. We finished our long morning with lunch in the sun-drenched courtyard of the Taş Han, a marble fountain gurgling beside our table. After that we trekked to Musa’s rug studio, where I had to pick up a few rugs for my friend Susan. Musa was busy making sarma (delectably spiced rice rolled in grape leaves) and invited us to sojourn on his terrace overlooking the Marmara as he finished them. A bottle of wine and a platter of cheese cubes contributed to a most enjoyable rest, especially after the six stories of spiral stairs we trudged to get up there. Musa was just too darn tired for the climb. Jeff headed back to campus to meet friends for dinner, but the girls and I were not yet spent. 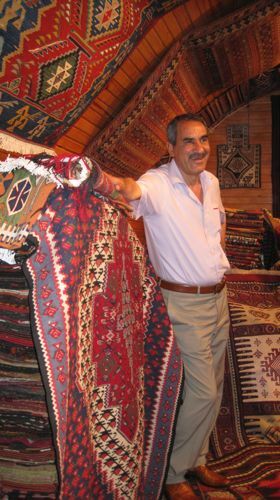 We decided to visit my friend Huseyin at his rug shop, Harem 49 (where we each found a treasure), then we wended our way to the Doy-Doy, a favorite Turkish restaurant with a lovely rooftop terrace. Before the mezes arrived, the rain came. What started as a light drizzle soon forced us indoors. Sigh… It rained for 40 days and 40 nights. Not really, but at times this week I’ve wondered. Rain kept us in on Sunday and continued Monday and Tuesday. The Ministry of Education closed down all the Istanbul schools because of rain. WHAT???? Well, all the schools except Robert College, that is. It was finals week here. Finals week at Robert is tantamount to sacred. Tuesday evening we headed back into Sultanahmet for a belly dancing performance at the Taş Han—one of my favorite “touristy” events. Jeff joined us for it, and I wasn’t a bit surprised when the first dancer chose him for a public lesson in humility. 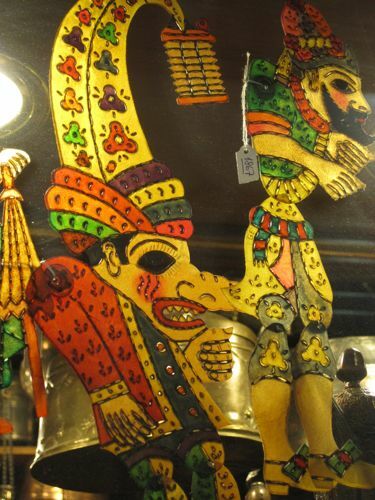 Jeff does his best to imitate this Turkish artisan. It was pretty darn cute to see an incredibly intelligent man out there shaking his booty with a scantily-clad beauty. After he resumed his seat, she chose a small group of women to learn the skill—and Laura got to entertain us with her antics as well. Laura takes a lesson from the pro. A good time was had by all. We hung in until the disco music undid us, then hopped a taxi back to Arnavutköy—a mere 5 lira each (that’s about $3). Not much is cheap in Istanbul these days, but the taxis are a pretty good deal (if the driver doesn’t rip you off, which is getting to be more common). My house is now brimming with new guests—Japanese this time, my lovely AFS daughter Mayu and her friend Genya. Oh, how I love showing off Istanbul. Goofy Genya and giddy Mayu at dinner. Dinner at the Takanik. YUM!!! Does this mean you will not be at Roberts College next year? If so I will really miss your adventures around Turkey.